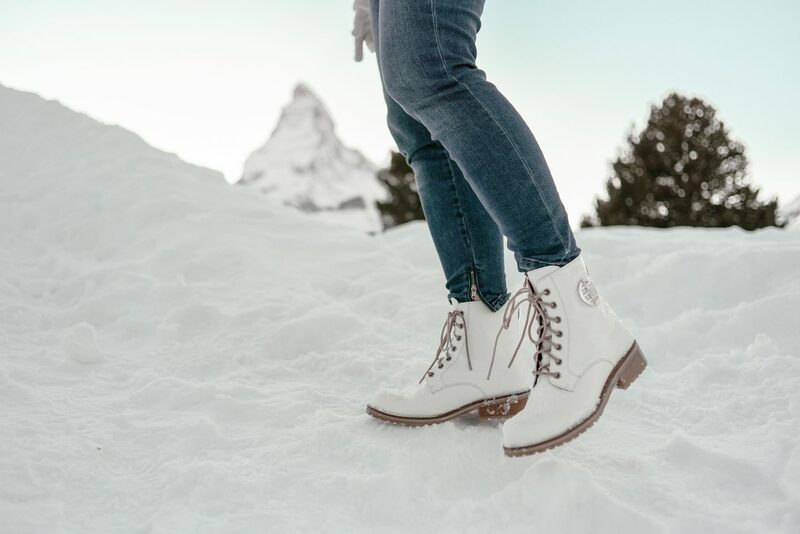 Our trip to Zermatt was probably one of the most long-awaited trips ever. The idea of visiting that incredible ski-paradise came after watching ‘Night Manager’ series. The Zermatt views left me absolutely speechless, and I dreamt of seeing it in real life every night. We were lucky enough to stay in the exact hotel where most of the Zermatt scenes were shot for the series, Riffelalp Resort 2222 m, but I will tell you more about this hotel in the next couple of weeks. 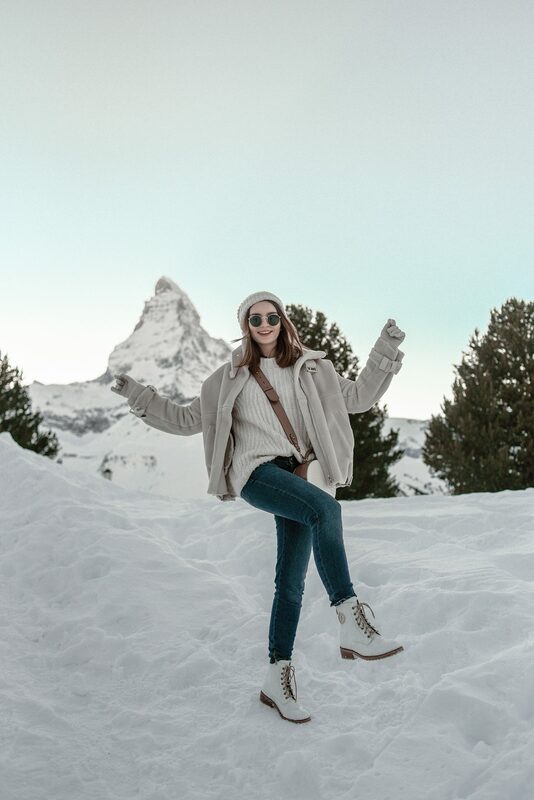 Our first impression of the place and surroundings was unforgettable, Zermatt simply looks like a Winter Wonderland and the view of iconic Matterhorn (everyone has seen it at least once in their lifetime, at the Toblerone packaging) from our room only made it more romantic. When I packed my looks for the trip, I wanted them to be as comfy as possible & stylish. Somehow 70% of the clothes I packed was white or creamy, and this is why I’m blending in surroundings nicely in 99% of my photos. This look was actually the same look I travelled in, and we captured these photos 30 minutes after our arrival. The white shoes with golden details by Elisabeth Moments completely stole my heart at the moment when I saw them. I was looking for the pair of beautiful white ankle boots for ages, and these looked exactly how I pictured my perfect pair. Elisabeth Moments is a Portuguese brand (read as ‘amazing quality and affordable prices’) that creates beautiful footwear and accessories; they have many different models available for purchase including stilettos, knee boots and sneakers, from their bags range I absolutely adore the backpacks that look very stylish and practical. 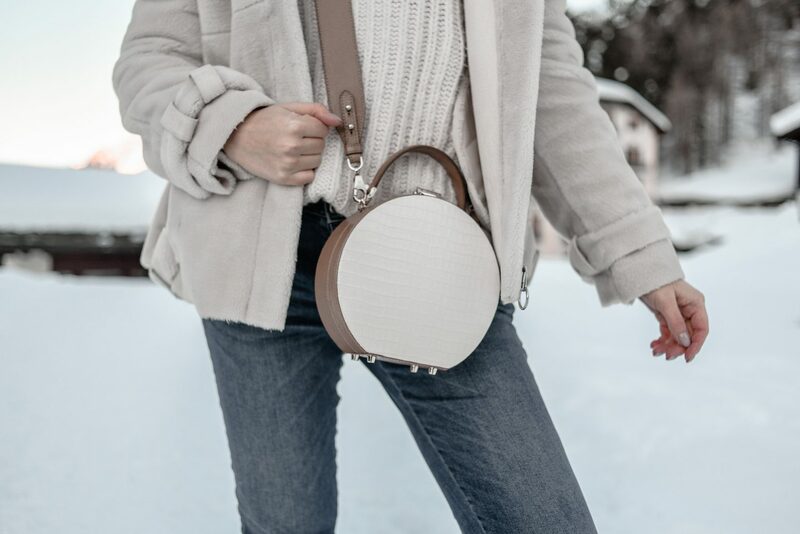 They made a perfect match to my Aspinal Hat Box that is easily my favourite bag shape of all times; this is why I already own two of these and looking forward to getting more for the Spring/Summer looks. As all Aspinal’s bags, that one is made of the highest quality materials and looks incredibly stylish. I absolutely love it’s vintage design thanks to the structured, round silhouette.